The global cash and coin deposit bags market continues to be driven by increasing focus on secure and safe packaging. Usually manufactured by using multi-layered polymer resins, manufacturers are now incorporating advanced features to boost the quality of end products. Some of the cash and coin deposit bags available in the market have advanced features, such as warning indicator and tamper-evident closures. The enhancement in security features is likely to boost the adoption of cash and coin deposit bags during the assessment period 2017-2022. However, broader macro-economic trends are likely to hinder market growth – many developing economies are making the transition to cashless payments, which is likely to impede sales during the forecast period. The global cash and coin deposit bags market is projected to grow at a CAGR of over 4% CAGR and reach nearly US$ 445 Mn in revenues by the end of the forecast period 2017-2022. On the basis of material type, the plastic cash and coin deposit bags are likely to witness a higher growth than the global rate and surpass US$ 345 Mn by the end of 2022. Plastic segment continues to be the leading segment on the basis of material type, and it is highly likely that the status quo will continue during the forecast period as well. Wide availability of plastic as a raw material, and low cost of end products are the key factors promoting the use of plastic cash and coin deposit bags. Financial institutions remain the largest end users of cash and coin deposit bags, accounting for nearly 30% revenue share of the global market. Cash and coin deposit bags are used for safe and secure transactions in financial institutions, owing to which demand has continued to remain steady in this sector. However, owing to shifting preference for cashless and online payments, demand for cash and coin deposit bags is likely to witness a decline in financial institutions during the forecast period. Europe continues to be the leading market for cash and coin deposit bags and it is highly likely that the status quo will be maintained throughout the forecast period. The Europe cash and coin deposit bags is likely to grow at a CAGR of over 4% throughout the forecast period 2017-2022. Relatively high preference for cash and coin deposit bags among financial institutions in Europe is likely to provide an impetus to the growth of the market in the region. In addition to Europe, Asia Pacific excluding Japan (APEJ) is likely to provide growth opportunities to cash and coin deposit bag manufacturers during the forecast period. Demand for cash and coin deposit bags in APEJ will be influenced by high volume sales of affordable bags. The leading companies profiled in the report include ProAmpac LLC, Coveris Holdings S.A., Dynaflex Private Limited, NELMAR Security Packaging Systems Inc., KOROZO Ambalaj San. Ve Tic. A.S, Truseal (Pty) Ltd, Illinois Tool Works Inc, Initial Packaging Solutions Ltd., Packaging Horizons Corp, A. Rifkin Co. A number of these companies are focusing on strengthening their global presence so that weaknesses in key markets are offset by growth in lucrative markets. Focus on R&D also remains a key focus area for many companies, as players look to consolidate their position by creating advanced bags that offer a high level of security and convenience. On back of these factors, the global cash and coin deposit bags market is likely to grow at a steady rate during the forecast period. Transparency Market Research examines the global cash and coin deposit bags market for the forecast period 2017-2022. The primary objective of the report is to offer readers a comprehensive and transparent analysis on the cash and coin deposit bags market. Qualitative and quantitative analysis on cash and coin deposit bags market has been offered to readers in an easy to understand manner. The report begins with a global outlook on the economic scenario, followed by a gist on the prospects of packaging industry. 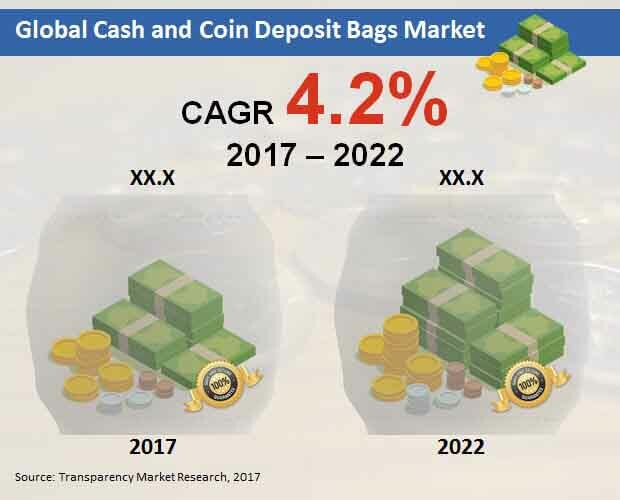 The overview on the global cash and coin deposit bags market offers an introduction to the market, and analysis on supply chain, pricing analysis, consumer surveys, and life cycle analysis. List of distributors and PEST analysis, along with an intensity map highlighting the presence of key participants is also offered in the report. To arrive at market figures, comprehensive primary and secondary research is carried out. Analysis on the basis of supply and demand side, along with evaluation of essential parameters, such as year-on-year (Y-o-Y) growth is also offered to readers. The growth of the market and each of the corresponding segments is also measured in absolute dollar opportunity. Absolute dollar opportunity is usually ignored during market research, but it is an important metric that can offer strategic information on the relative growth of the market. Readers can get valuable insights from the relative absolute dollar opportunities of different segments discussed in the report. In a bid to give readers detailed insights on the global cash and coin deposit bags market, the report offers segmentation on the basis of product type, material type, end use, and region. On the basis of product type, the segmentation has been offered on the basis of opaque and clear. By material type, the segmentation has been offered on the basis of fabric, paper, and plastic. The key end users in the global cash and coin deposit bags market include financial institutions, casinos, hotels, retail chains, hospitals, courier services, academic institutions, and government organizations. The regional outlook offered in the report offers analysis and insights on the markets in North America, Europe, Latin America, Japan, Asia Pacific excluding Japan (APEJ), and Middle East & Africa (MEA). Region-wise analysis helps readers in understanding how the market is performing in different key regions. It also gives readers an overview on the economic, political, and business environment in key regions. The report also offers company share analysis and competitive landscape, giving readers an understanding on the prevailing competitive scenario in the market. The competitive landscape offers detailed company and product overviews that give readers critical insights on the strategies of companies. Some of the leading players profiled in this report include Packaging Horizons Corp, KOROZO Ambalaj San. Ve Tic. A.S, Dynaflex Private Limited, Illinois Tool Works Inc, Truseal (Pty) Ltd, Initial Packaging Solutions Ltd., Coveris Holdings S.A., NELMAR Security Packaging Systems Inc., ProAmpac LLC, and A. Rifkin Co.